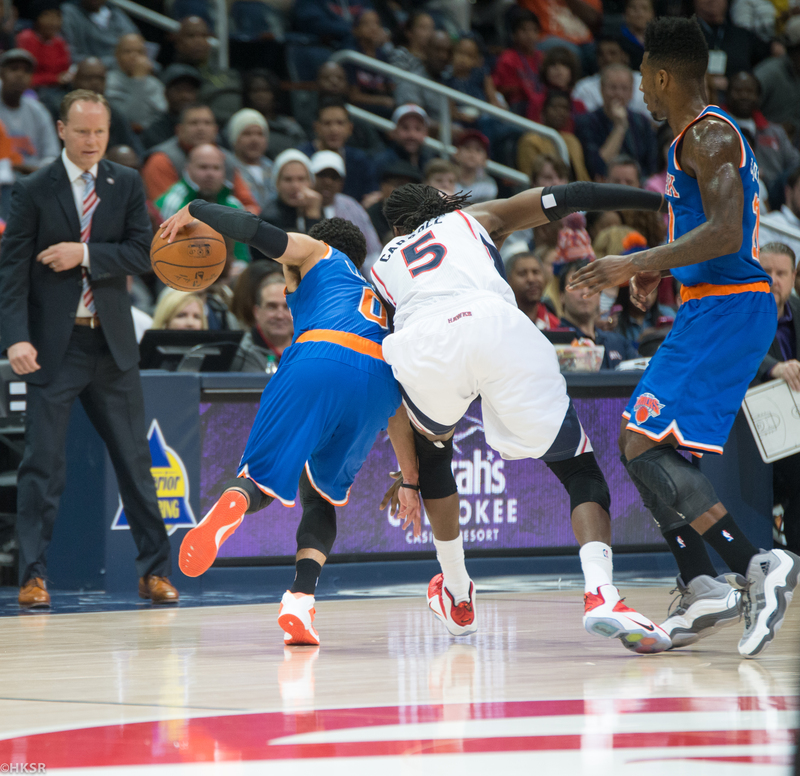 It was an exciting night for basketball fans as the Atlanta Hawks faced the New York Knicks. Neither team was in rhythm as the Hawks were (1-3) and the Knicks were (2-4). Coming off a 3-game away losing streak, the Hawks were hoping to keep their home-court form in anticipation of the visitors. The Hawks rank 1st in the NBA in Assists with 26.5 per game and Kyle Korver needs 7 more 3-pointers to tie Nick Van Exel for 20th in NBA History. Carmelo Anthony was on fire in the 1st Half for the Knicks with 14 pts. and 8 rebounds. Tim Hardaway Jr. had a good start with 9 pts. and 2 assists. JR Smith had 8 pts., 4 rebounds, and 3 assists. The Knicks were firing on all cylinders and kept good ball movement. Once they took the lead in the 1st Quarter they kept it until late in the game. At halftime they were up 61-48 on the Hawks. The 2nd Half told a very different tale. 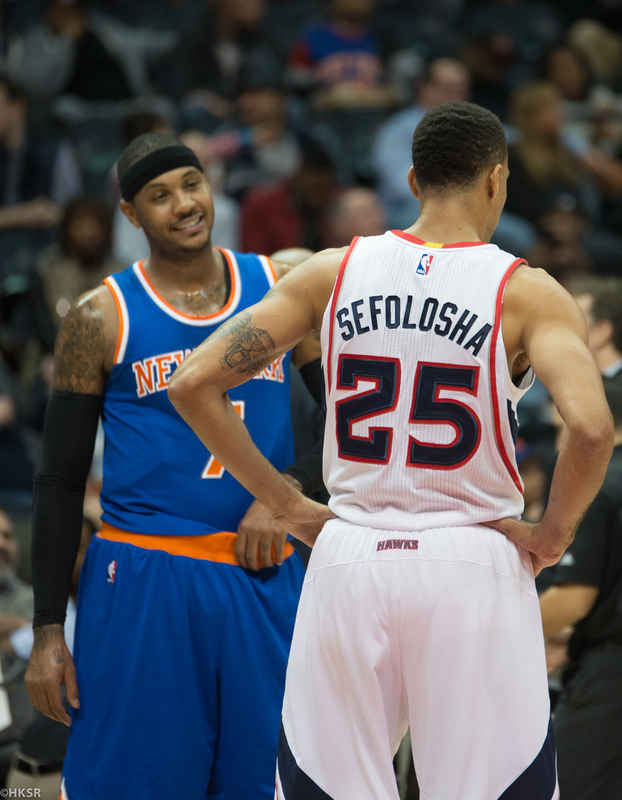 Atlanta began capitalizing off New York turnovers and finally found their form. Kyle Korver was clutch in the 2nd Half scoring 16 pts. He went 100% from the line (Free Throws) and 4/6 for 3-point attempts. 3 Hawks put up double-digits in the 2nd Half: DeMarre Carroll, Kyle Korver, and Jeff Teague. After Thabo Sefolosha was fouled hard on a lay up, the crowd grew louder in support when they took the lead 75-74. From then on the arena was electric and you could feel the momentum swinging towards the home team. Dennis Schröder, who hadn’t logged many minutes this season, had an excellent game and helped with the Hawks comeback with 5 steals. Once the 4th Quarter started the Hawks held their lead and went on a shooting spree. With 17,521 in attendance, they held their home-court and pulled off the comeback with a 103-96 win. They were able to shut down Carmelo in the 2nd Half and completely decimate the Knicks’ rhythm. Korver had a team high 27 points and shot 6 for 9 from 3-point land. Jeff Teague led the charge with 5 assists while Paul Millsap anchored the defense with 13 rebounds (11 defensive). The Hawks will face the Knicks again in New York on Monday.